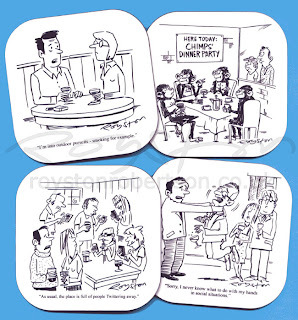 Sets of cartoon coasters (above, click to enlarge) featuring my gags are available for sale over at cartoonz.co.uk – the ideal Christmas present for the person in your life who likes a drink and a laugh but also likes to keep their table free of marks! They are available as sets of four, with various designs on a drinking and socialising theme, to choose from. 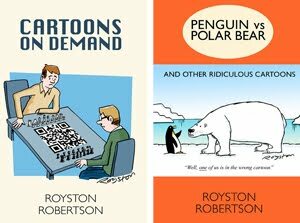 Steve Willis, who runs the site, gave me two sets featuring my cartoons last week and I was impressed with the quality and also how well cartoons work in this context. My dad worked in the licensing trade when I was a kid and I remember cartoons were very popular on beermats back then, particularly gags by Larry. Coasters and beermats are a no-brainer for cartoons really, I suppose, as you've simply got a square blank canvas which is about the size of a magazine cartoon. Go buy!